Growing herbs in a worm farm is a great way to killing several birds with one stone! Firstly recycling organic materials that would otherwise have gone to a landfill site and most probably have rotted in an anaerobic environment and produced greenhouse gases in the process is not only a good way to reduce pressure on our environment it can as well be converted into one of the most amazing soil conditioners know to mankind and assist in growing a crop of lush and heathy herbs on a very small space. All you need is a container with a volume of at least 50 liter / 13.24 liquid US gallons, 2 smaller buckets with a volume of about 5 liter / 1.32 gallons, enough good compost to fill the big container, kitchen- or other organic waste to fill the smaller buckets and a small batch of compost worms. We converted half an old wine barrel for our herb-garden-worm-bin but a plastic bin will do just as well. - Fill the big container about half full with the compost or garden soil mix, making sure that it has openings at the bottom for excess water to drain into. - Drill plenty of 5 mm / 1/5 of an inch holes into all the bottom, side and lid of both smaller buckets. The more holes the better. These holes will enable the worms to crawl in and out of the buckets. lids should stick out just a little bit over the top edge of the big holding container. - Fill both buckets with kitchen scraps or other organic waste, close the lids and fill the rest of the big container with your compost / garden soil mix. - Finally add the compost worms to a few places of the surface of your big worm bin. They will burrow down quickly to get away from the sunlight and will soon start to feed on the organic waste they will discover in the bin. - The worms will aerate and loosen the soil in your bin and their poop / worm castings will feed your herbs inside the bin. - Remember to water the surface of your herb-garden-worm-bin in regular intervals and see how your container will develop into a lush jungle of wonderful herbs. - Check the amount of organic waste inside the two small containers every couple of weeks and if needed top them up with fresh organic waste. 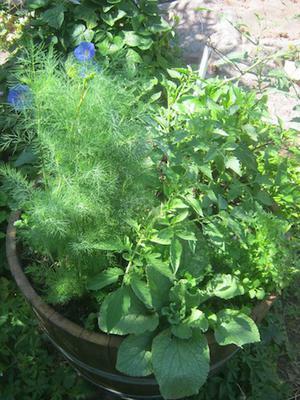 The picture shows our herb-garden-worm-bin in full swing. All the herbs you see in it where grown from seed.